The Institute of Banking Personnel Selection successfully conducted the IBPS CWE Clerical V examination in the month of December/January 2016. All the candidates are eagerly waiting for the results and would like to know about that there would be interviews or not. 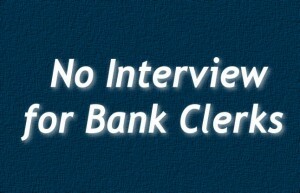 In this aspect, there would be no Interviews for IBPS Clerks in Public Sector Banks. The notification refers to the announcement made by the Hon’ble PM in his address to the Nation on the occasion of Independence Day on the discontinuation of interviews in the recruitment process in Public Sector Banks. 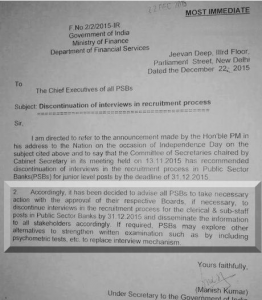 Accordingly, it has been decided to advise all PSBs to take necessary action with the approval of their respective Boards, if necessary, to discontinue interviews in the recruitment process for the clerical and sub-staff posts in Public Sector Banks by 31.12.2015.The Public Sector Banks (PSBs) may explore other alternatives to strengthen written examination such as by including psychometric tests, etc. to replace interview mechanism.